I spent last week in the region of El Chaco, which is located in southern Bolivia on a work related trip to investigate the possibility of implementing a project in the region to provide water using solar pumping systems. It was a very interesting trip. I expected the weather to be very hot (up to 40C), but luckily the days were mostly cloudy and the extreme heat doesn’t start for another month or two. We are working with an NGO called Energetica, which specializes in solar panels, and has done several solar pumping projects. 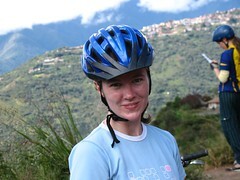 Pictures from "Biking the World's Most Dangerous Road"
I am back from my trip and have been able to upload my pictures from the bike trip and weekend in Coroico for all to enjoy! The pictures don't do the road justice! 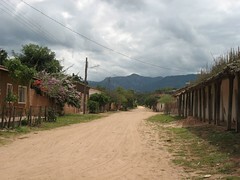 I will post another entry about this past trip (to El Chaco) as well as the pictures soon! I survived the bike ride! And it was awesome. I must say there is nothing like rushing down a dirt road on a bike in the middle of the most gorgeous countryside. Six people from the office decided to take a trip this weekend, taking advantage of the fact that we had Friday off. We started at 7am on Friday in La Paz with the company Solaris. 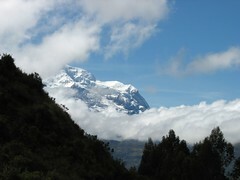 From there, we got on a bus and drove to La Cumbre, at an elevation of 4,650m where it was cold and rainy. Luckily I had brought rain pants! There we were given our bikes. We started off down the highway. For two hours we biked downhill on the side of a paved highway, with freezing fingers and wet faces. Now and then we would emerge from the rain for a while but we would then end up back in it a few minutes later. 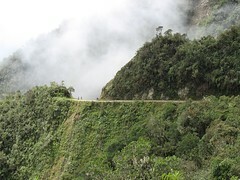 There was a short uphill section, about 30 minutes, which at an elevation of 3,500m is difficult! I spent today hiking and it was great. I went with Club Andina, a trekking club of sorts. A friend of mine invited me for the day. There were five of us, plus a guide. We started off hiking the Canyon de Palco. About an hour from La Paz, we were dropped off a little ways from the canyon, walked down to it and then walked for a couple of hours in the canyon. Our feet got a little wet, but it was a great hike! At the end of the excursion, before walking up to the town of Palco we had a little picnic lunch. The minibus picked us up in the town. I was away from Wed to Sun night last week, for work of course! 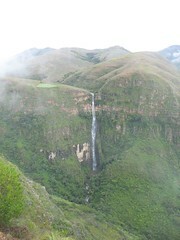 I flew Wed morning to Cochabamba with two other women from the office. We had a capacity building workshop from Wed to Fri. The workshop was being given by UNICEF to community-based hygiene promoters. It was a very interesting 3 days and I think I probably learned as much as they did! The hygiene promoters are people who travel to communities in their municipality and hold hygiene promotions sessions, follow the construction of water systems and latrines, and do basic repairs to water taps and systems. While I was working in Santa Cruz, I was able to take two days off to explore! One day we went to Biocentro Guembe, just outside of the city. It was a lot of fun! The other day was my last day in Santa Cruz (although not forever because I am actually going to be back there in a week!) and I wandered around the city centre and did some shopping. Biocentro Guembe is a lovely park with pools, lakes, a butterfly conservatory, a few short trails and a great restaurant. The whole day cost us 120Bs ($18) including a delicious buffet lunch. I went with two coworkers and another friend who works in La Paz at another UN agency. We got there early in the morning and went through the laboratory where they keep all sorts of butterfly specimens and caterpillar specimens. It was really interesting! There was also a tarantula, which all the others in my group held, but I did not!! After that we went wandering through the butterfly conservatory and up to a lookout. As you can see from the photos, there were a lot of butterflies! We had a fantastic buffet lunch, and then wandered around the lakes a bit. 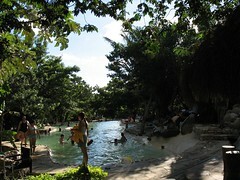 Finally we took a dip in the pool, which was refreshing and a lot of fun! All in all it was a well-deserved day of relaxing for all of us.